Folded color map in Spanish with some legends and brief history also in English. 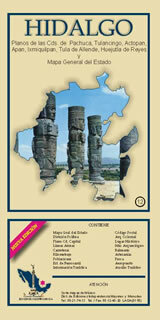 Includes state map (scale 1:357,140), Tulancingo (1:25,365), Pachuca (1:16,385), and Tula de Allende (1:15,460). Also has inset of archaeological zone Tula and postal code information.